On his fantastic debut, Simpson covers the good -- and bad -- sides of living in Detroit. Detroit has rightfully earned its reputation as one of the most dangerous and crime-ridden cities in America, with its statistics for robbery, burglary, larceny, and auto theft checking in well above the national average. Consequently, many children and teenagers who grow up in this destitute environment are forced to turn to drug dealing and crime as their only opportunity to make a buck. Opportunity is scarce, and life is never easy for many of the city’s impoverished citizens. But Detroit does have its redeeming qualities, acting as a breeding ground for innovative culture since the mid-1900s. It has been home to artists who have developed some of the most groundbreaking musical ideas in history, ranging from the punching grit of Motown legends to the vicious lyricism of Eminem to the rock-rap fusion of Kid Rock. In spite of the city’s turmoil, some of its inhabitants have produced vivid audio snapshots of what it is like to struggle in this squalor, using their music to rise above these abject conditions. Guilty Simpson, a magnificent emcee from Motor City, is precisely the type of lyricist who can vividly capture the essence of modern Detroit lifestyle. Unlike a large chunk of emcees from the area, Simpson came from the streets and still lives in them, making his debut album Ode to the Ghetto a poignant, topographic account of residing in the Detroit slums. This record has taken years to get a release date, and it is fitting that Simpson had to face a gamut of obstacles to get to this point. 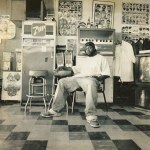 He was taken under the late J. Dilla’s wing, but was left in release limbo when the producer passed away. He dotted the underground scene with bristling tracks on Stones Throw compilations and maintained a low profile. But after years of struggle, he has finally been given the opportunity to channel his frustrations and experiences into a full-length debut. Ode to the Ghetto is the street opus that Guilty Simpson has previously proven to be capable of crafting. He covers almost every facet of life in the ‘hood with his rapturous gravel tone, consistently doling out complex rhymes in a deliberate and steady way. He is a gangster from the streets who practices what he preaches, but remains witty and cerebral. To enhance his lyrical flair, he has a rich roster of producers providing beats, ranging from Madlib and Oh No to Mr. Porter and Black Milk. With these musicians by his side, Simpson has made one of the most honest and captivating records to come from Detroit’s hip-hop scene in recent years. With his vividly graphic depiction of the area’s urban life, he provides listeners with an insider’s view of what the city’s modern urban landscape is truly like. Simpson discusses the city’s crime in greater depth on many of the other tracks, focusing on specific rotten elements of Detroit life like burglary and murder. “Robbery”, produced by Mr. Porter and featuring a searing melodic sample, is a kind of twisted lullaby with a sing-song chorus where Simpson encourages the listener to join in the fun. Although the track deals with serious crime, he adds a comedic twist in his lyrics, rhyming “I'm there to take that cheese / I've got manners, I still say please / Please, tell me all you know / I want cocaine, weed, ice and all your dough.” But he also approaches subjects with a serious demeanor, airing his frustrations on the Madlib-produced “Pigs,” slinging lyrical jabs at cops for their corruption and unwarranted targeting of Detroit’s black population. Even though Ode to the Ghetto is filled with harsh tales of the streets, it is balanced with a handful of sensitive and affecting tracks, revealing a softer side of the emcee and giving the disc a much broader spectrum of emotion. “The Real Me”, one of the best songs on the album, deals with the harsh realities of living in a world full of crime and its internal ironies, such as “Barely got a pot for roast (I'm starvin') / But always have pots for coke.” Detroit-based producer Black Milk loops a supple wooden flute and mixes it with a smattering of industrial drums, matching Simpson’s sentiment with a poignant musical counterpart. The rapper also gets romantically personal, discussing relationship woes at a Red Lobster on the J. Dilla-produced “I Must Love You” and a troubled female fan on “She Won’t Stay Home,” a Motown-inspired track featuring a crackling beat from Madlib. Simpson covers all the bases of street life on this fantastic debut, and like some Detroit artists who came before him, he offers a unique recounting of the many facets of city life. With his careful delivery and pensive rhymes, he plays against the raspy beats with complicated delivery, providing listeners with a thug’s perspective of real crime activities. It has taken him a long time to put out this record, and it is clear that he wisely used his idle time to hone his craft and enhance his skills. If he continues to draw inspiration from his environment and can make more records that flow as smoothly as this, listeners across the world will be able to keep their finger on the Detroit pulse, with Guilty Simpson as their captivating guide.